The Legal Genealogist is in Iowa today, for the second day of the Annual Fall Conference of the Iowa Genealogical Society. And it’s impossible to be here in Iowa without being struck, once again, by the courage and fortitude of one short-term resident of the Hawkeye State, my third great grandmother Elizabeth (Buchanan) Baker. I’ve told Elizabeth’s story before,1 but it’s a story that bears repeating — and is much on my mind this morning. That was the first time Elizabeth must have gathered up her courage as she left everything she knew to follow Martin off into no-man’s-land. And I can’t help but think that she must have looked back, over her shoulder, thinking of those — her parents, her brothers and sisters, her extended family — she was leaving behind. The distance from her old home to her new was more than 170 miles. Perhaps she thought they would visit back and forth; likely she realized that some, at least, she would never see again. I can’t help but think that much had been lost in the move from Cherokee County. I can just picture Elizabeth as she looked back, over her shoulder, once again leaving behind everything she knew — including, we believe, a daughter, whose existence was reflected in the censuses,14 whose name was recorded in family histories as Susan,15 and who was never seen again in family or public records after the Bakers left Cherokee County. It isn’t clear to me that Elizabeth even had a chance to get comfortable in Pulaski County before it was time to leave again. Although Martin and sons Josiah and William were taxed in Pulaski County, Kentucky, in 1851, oldest son David D. Baker was not.16 He had gone ahead to Louisa County, Iowa, and, by 1852, Martin and William would follow him west. 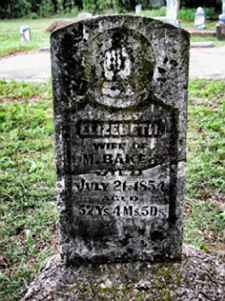 Elizabeth was 56 years old in 1853; she would turn 57 in March of 1854. She had to have known, this one last time that she looked back, over her shoulder, as the wagon carried her beyond the sight of children and grandchildren waving goodbye, that she was never going to see them again in her life. But even then she didn’t falter in her courage as she set off, one last time, en route to yet another unknown place. We’ll never know for sure if Elizabeth lived to see the family’s new home in Parker County, Texas. One family story says she died in Arkansas while the family was en route to Texas from Iowa. Before she died, the story goes, she made the family promise that if they buried her there, then once they got settled in Texas, they’d come back for her and bury her on their land near their new home.23 Others say she died after reaching Texas. But I’d like to believe that she got there and approved of Martin’s choice of land. I’d like to believe that she met and perhaps even approved of her soon-to-be son-in-law George Washington Cottrell. I’d like to believe that she was surrounded by as much comfort as the frontier could offer when she breathed her last in July of 1854. And I’d sure like to believe that, if the chips were down, I’d somehow find I had even a fraction of her courage. Note: An earlier version of this post appeared on 21 July 2012. Lovely story – made me cry a little. You have a gift for putting flesh on the dry bones of history. Isn’t it amazing how often they moved? The first thing I learned when I started investigating my family was that they did too live far from family and continuing to look for them nearby was useless. I did not realize that my David Davenport and Dorothy Baker we’re living next door to your ancestors in Macon Co. It’s been years since I looked at that census. It’s strange that my great aunt who first gave me my glimpse into the NC line told me that Dorothy was a Buchanan, not a Baker. At least now I can “see” a Buchanan connection. Thank you for your post! You come from “good stock” Judy. Might even say that pioneering spirit is still alive in this Cottrell/Baker girl…and if the “chips were down”, I would bet money you would pick up and move on. But wait…you have already done that! Somebody pay me. I both admire and feel sorry for the women of this era, because I have to wonder if at least some of them were dragged kicking and screaming off to a new home they didn’t want. Who would want to leave a somewhat comfortable (by their standards) existence to one of extreme hardship, and to do it perhaps, as in your ancestor’s case, several times? I had many ancestors who also came from the east coast, through several homes farther west and farther west, till they got to the Midwest, where they stayed (and where I still am–I live only 35 miles from my childhood home, and I plan to die here, though not for some years yet, I hope–I still have lots of family history work yet to do). One ancestor went from Arcade, NY to Iowa Territory in the 1840s, with some of her grown siblings and we are so fortunate that she and others wrote letters back to a friend in their town–those letters were saved and have been printed in a genealogist-created book which her descendants are so thrilled to have. We have few photos of Hannah, but with these letters, we get a good glimpse into her personality, which was amazingly funny and showed all they went through in their frontier life. Another of my ancestors made 3 or 4 moves to frontiers on the east coast with her husband, then said “no more” when she was in her fifties, and stayed where she was while he took some of their many adult children and went into the wilderness once more. I think that many of these women did what they had to do, and we can all be grateful for them, or we wouldn’t be alive today, but for many of them, I’m afraid it was probably a case of the wife being basically forced by society to share whatever her husband told her would be their life, and to cope with it. Some of them probably coped better and more cheerfully than others. I certainly salute them all.